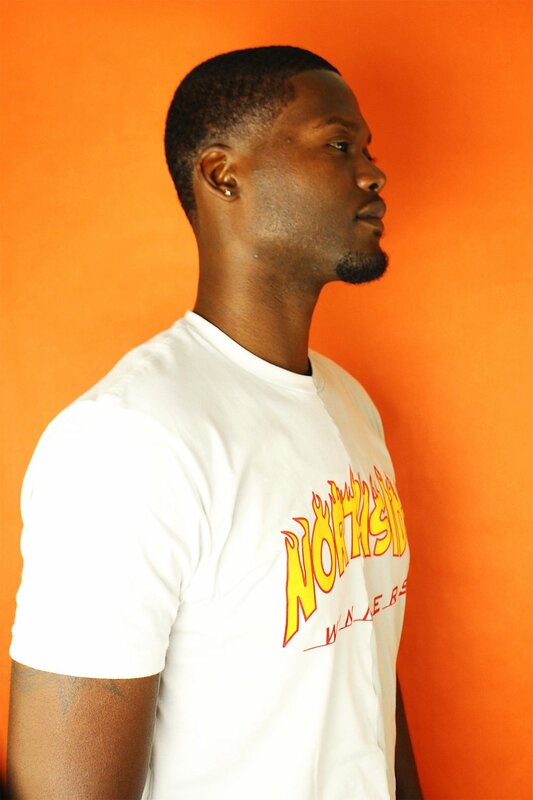 The third streetwear brand created by a local 20 something is called Northside by KamekoLeon. He will be joining Travail and Unhealthy Living during the fashion display August 11 in downtown Winston Salem, NC. During our photoshoot we were able to talk about how he ended up in the streetwear world and collaborating with some of our favorite creatives from Winston Salem. You were born and raised here, right? I was born on the Northside but raised on the West and South so that's what I claim. KL: I was born on the south but raised on the North and I went to North. What do my waves look like? KL: You can take photos of this shirt if you want to. KL: No one has seen it yet and it was made by Modesti. She sews and she just finished it and gave it to me yesterday. She's a beast. The latest shirt that had not been released yet was a collaboration with Modesti Hooper owner of Deconstructed Modestly. Who is your biggest supporter? I am assuming people from Winston. KL: It's like 60/40. 60% the Northside of Winston and 40% I ship out. I ship to LA, Canada, Hawaii, and Germany. So I heard you say you were born on the South, but being raised on the North is that why you decided to put it on a shirt? That's what's up, that makes sense. Do you want to add other pieces besides t-shirts? KL: For sure. I have a lot of other things coming, some I wanted to bring to the event but it takes to long to have it manufactured...I do have a new graphic artist on the team and the next shirt you will see me drop will be with him. When is the next shirt dropping because that last shirt sold out and I obviously don't move fast enough? KL: Northside vs Everybody is coming out next. KL: You work with my cousin, Meezy. It's a small world, yea. I met him because the very first 20SDS he came and supported them all. He is going to be apart of 20SDS this year as well. Friday he will be apart of the podcast and on Saturday he will be hosting a panel. KL: I'm happy for my boy... you do things that he would be into. I never thought I'd be into this. When I was in high school this wasn't me. KL: This hasn't even been a whole year for me yet, I started in October 2017, and I wasn't expecting it to take off like this. I have a lot of stuff coming it's just not ready yet. I have a spin on the Donald Trump MAGA hats that I want to release. I'm trying to have them done by 20SDS but if it's one thing I had to learn is patience in this. That's a dope story. I studied fashion and I'm into art so to hear someone who was not into these type of things creating their own lane and making it work for them is amazing. KL: Yea, it's going well. What I can say is, even though I was never into it I always knew how to dress within my means and look nice. I can iron the f*ck out of a t-shirt. BRUH! I noticed that when I placed your shirt down. It's good and starched! So who would you say is your typical customer? KL: At this point, I don't know anymore because now I'm selling to people I don't even see or know. At first, I didn't think it was going to take off. I reached out to a few clothing lines for help but some didn't respond. That's when I met Jimi from TLR and they kinda showed me the way. I would come to Jimi with my designs on a napkin and tell him to "make this make sense." I would ask Kwame (Meezy) his opinion a lot but then it got to the point when I didn't need anyone's opinion. It is harder to get black people to support but what does help is consistency. Every time I drop a new shirt I get a bigger following. That's a gem and the attitude I'm trying to keep this year with 20SDS. Northside by KamekoLeon will be apart of the fashion display August 11 downtown Winston Salem at the Embassy Suites. He will have clothes for you to purchase and you may be able to jump on his exclusive collaboration with Deconstructed Modestly. Make sure to follow Northside by KamekoLeon here. You can purchase tickets here and use the Discount Code: NORTHSIDE for 35% off.